Lifelong Learning following a special ceremony at Royal Plantation recently. 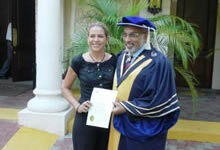 Grant, general manager of Sandals Dunn's River and former Hotelier of the Year, was conferred with a honorary doctorate, while Spittle, general manager of Beaches Boscobel, received a doctorate. Below: Another 30 team members from Sandals, Beaches and Royal Plantation resorts were awarded their Bachelors Level 2 and Masters Degrees at the ceremony and at a second ceremony in Montego Bay, St James. 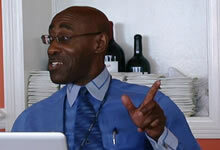 GULL is a non-profit foundation which provides systematic approach to lifelong learning. In making the presentation to Grant, GULL President and Co-Founder Dr Richard Teare said he was being conferred with the honorary doctorate in recognition of his career-long professional attainment and his support of others in the industry. members and managers so that they might achieve their full potential." 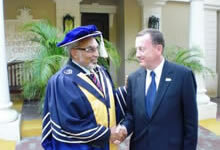 The GULL president spoke of the need for organisational responses to changes in a global world, adding that Grant's contribution to the development of the hospitality industry in Jamaica is reflected in numerous prizes and awards. He was the Jamaica Hotel and Tourist Association's 2007 Hotelier of the Year and in 2008 was conferred with the Order of Distinction for Meritorious Service to the Tourism Industry. He hailed Sandals Resorts International's vision in seeking to empower team members and noted "There is no company stronger in its field than Sandals". He also praised the development he had seen in the resort chain adding that action learning would help team members to further advance their careers and contribute to the future development of the company as well as Jamaica's hospitality industry. to be". He lauded GULL's effort as an organisation "that teaches people to think". "The hotel business is a challenging profession that requires effort, discipline and a willingness to keep learning," he emphasised. 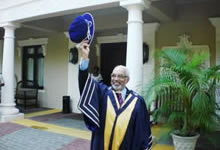 told the graduates that self-actualization was the only way to transform their lives. Sandals Resorts is well known for". 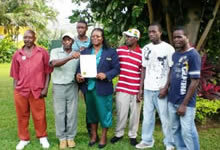 Sandals Montego Bay's Landscaping Supervisor Beverly Robinson (centre), receives her certificate of completion of her level 2 Bachelor's programme from GULL President Dr Richard Teare. 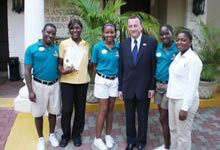 Looking on at left is the resort's executive assistant manager, Dawn Smith. all her achievements but I know this is just the beginning for her," noted Broomfield. Learning and working are fully integrated so as to sustain learning as well as recognising skills development and attainment. The programme has been fully endorsed by Sandals Resorts International with the aim of providing easy access to professional and academic excellence in the workplace. This will result in more team members having the chance to further their education. GULL is a not-for-profit foundation registered in California, USA. GULL is recognized by the Government of Papua New Guinea & endorsed by other Governments, Leaders & Institutions.